As the 10th anniversary of the busiest hurricane season on record approaches, forecasters and government officials are preparing for the start of the 2015 season. 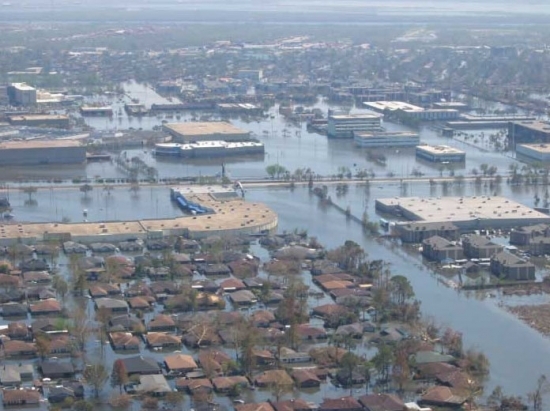 But unlike the 2005 season, which saw an unprecedented 28 storms — including one of the worst, Hurricane Katrina — this season is expected to see fewer than the average number of hurricanes. “We’re on the doorstep of the Atlantic season and we’ve got to be ready for whatever comes,” NOAA administrator Kathryn Sullivan said during a press conference held in New Orleans, a nod to the upcoming Katrina anniversary. It is possible that none of those hurricanes will reach major status — defined as Category 3 or higher on the Saffir-Simpson scale of hurricane strength — though the predicted range is up to two major hurricanes for the season. Counted in those numbers is Tropical Storm Ana, which formed before the official season in early May, making landfall on the South Carolina coast on May 10. Such early storms aren’t entirely rare, happening every few seasons or so, though recent research suggests that global warming could stretch out the hurricane season by making conditions more conducive to storm formation over a longer period of time. “These will be maps that show you your neighborhood,” Sullivan said. Specifically, it increases wind shear — change in wind speed or direction with altitude — which can strangle a burgeoning storm, and leads to a more stable atmosphere, the opposite of what a tropical cyclone needs. This El Niño likely also played a role in keeping activity low last season, even though it hadn’t yet fully formed. But it looks to be strengthening now, with a 90 percent chance that it will last through the summer, according to NOAA forecasters. 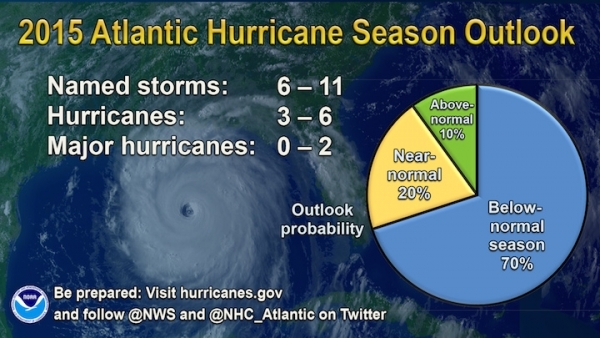 Officials are worried that the forecast for a below-normal season, along with the nine-year “drought” in major hurricane landfalls (Sandy was the equivalent of a Category 1 hurricane) will lead to complacency on the part of those living in vulnerable coastal areas. The last major hurricane to hit the U.S. was in fact in 2005 when Hurricane Wilma hit southern Florida in October of that year. FEMA deputy administrator Joe Nimmich warned that people and communities still need to be prepared, even for storms that don’t reach major status, since a tropical storm can still cause disastrous flooding. “It doesn’t take a hurricane to make a disaster,” he said.